A new school year can be daunting for any child. New classroom, new teacher, new friends. Starting the school year while living at a homeless shelter often means added anxieties: do I tell my teachers where I’m living? What about my friends? Will I stick out if I don’t have new clothes and the right school supplies? 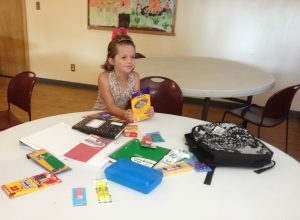 Thanks to the congregation of Eve rett United Church of Christ, every child who stays at The Family Shelter this school year will have the supplies they need to help them enter their new classrooms with confidence. Children at the shelter need new school supplies year round. Families come to us with very few resources and their children may be starting a new school mid-year. The congregation at UCC has pledged to provide all of the necessary school supplies for the entire year. Last week, the kids started receiving their backpacks. It was a day filled with pencils, notebooks, rulers and plenty of smiles.